CV-Check™ identifies 20 common CV problems in these categories. Your CV is often your first and only chance to make a great impression on an employer. 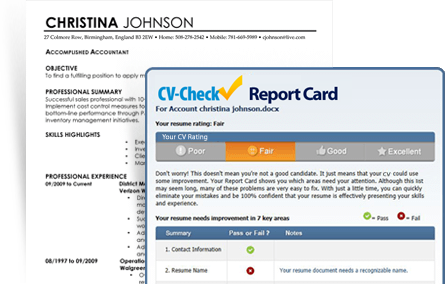 Managers will scan your CV for just 10 seconds to see if you're right for the job. Are you selling yourself effectively? How impactful is your word choice? Is your CV easy to read? Is your CV easy to follow? One spelling mistake could cost you a job. Too long or too short? Or, too short in some places and not enough description in others? Are you using proper English?